This has been my year-ender for 5 years now. It's an absolute belter and well worth the long trip up from Windsor to Haworth. I've taken to staying a night or two beforehand at the excellent Fleece Inn in the High Street to save crazy early travelling and, more to the point, justify a pint of Boltmaker the night before. 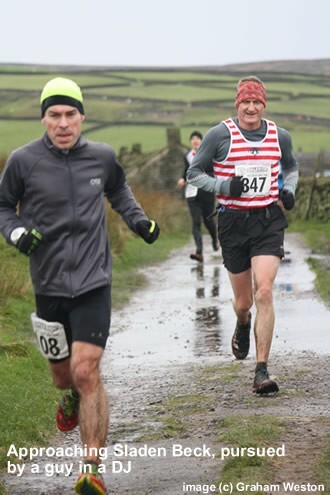 Haworth had been hit by the floods - the refurbished-at-a-cost-of-£250K pub at the bottom of the hill had been half washed away - so I asked the race director if it was still going ahead. This filled me with shame for a couple of reasons, firstly because of the triviality compared to how some were suffering and secondly because this race would go ahead during a nuclear attack. There is a B course for use when the weather has frozen the A course so hard it's too dangerous and as it avoids the double crossing of Sladen Beck on the out and back route, I'd assumed we would be using that. Incredibly, though, when I arrived a couple of days before the race there was absolutely no trace of the flood waters (apart from said pub) and the Winter was still broken, pushing out the warmest temperatures on record. This is the Brownlees' local race and each time I've run it one or both have been here, one usually wins and both end up in the pub (they have a reserved seat in the place which is essential as it's packed to the rafters afters). Not this year it seems. Ali was having a foot operation that day and I heard Johhny was helping out his flood-hit folks somewhere so there would be a new winner. He (Ali) was present in spirit though as his face (as last year's champion) was plastered over the bottles of Daleside Old Leg Over that form the goody 'bag' of this ridiculously cheap (it's Â£6!) race. It's just a mile jog over the moor from The Fleece Inn so as usual I leave it to the last minute and do my best to get lost finding the small hut where they dish out your number and the beer! I know a few from Lincoln and District who run this every year including my cousin's partner but I left it too late to find them until after. 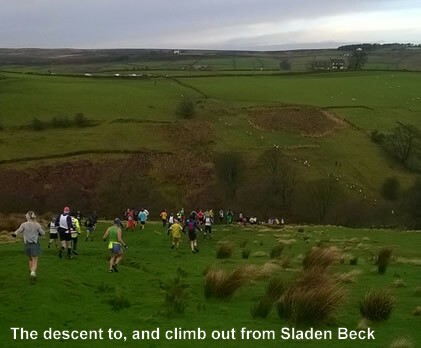 It's hard to spot anyone because half the field turns up in fancy dress - many of which could not look more unsuitable for fell running - and you end up savouring the inventiveness. I see inflatible spherical sumo guy is back - admittedly it could have been someone entirely different! - who I only just pipped to the line last year. There's also a zebra-striped emu thing which looks like trouble on the mud! There's a Grim Reaper and I idly wonder if I legged him over would I be cheating death? I obviously can't carry the beer on the run and brought no bag so I handed it to a random spectator who reacted as enthusiastically as if it were a bag of rubies. We assemble in the quarry in a rag tag mass and are foghorn-ordered "BACK!" to the invisible start line some yards behind by Dave Woodhead who gives the pre-race briefing - which in entirety consists 'if you get run over, it's your own stupid fault'. Some secret signal the birds use sends us off, regaled by a piper. It's a swamp and the mass flailing jostle to escape the bottleneck exit from the quarry and bolt down the slope to the short stretch of road claims a few fallers. I'm not one of them but as always marvel at how fast some people can travel over this bog. I pick up some places on the easy trail - I'm sure this is the dryest I've ever seen it. Then comes the mad descent over a field down to the stream which gets ever steeper and more waterlogged, and I lose all those places again, arms wildly windmilling Emelie Forsberg style. A quick plunge through the beck and a hard climb out the other side which reduces me to a crawl, compounded by the fact that there's no grip. 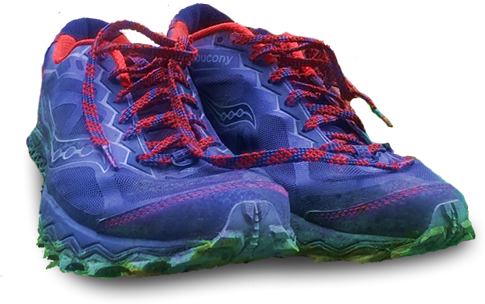 The Saucony Peregrines aren't much use on the mud. Perhaps they know they're going in the bin after this thanks to both uppers splitting and are phoning it in? It's the kind of mud that does the steering for you. Top of the field joins the Pennine Way and climbs to a derelict building at Top Withens, along to another trig post on the ridge and then starts the return leg. I love this bit. It's a crazy descent on the edge of out of control with a minefield of bogs that will consume a leg to the knee and send you over. 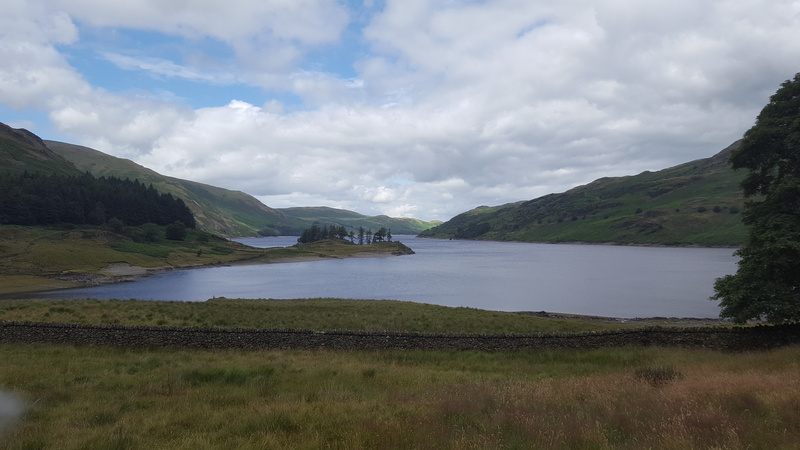 I went down twice, under a cloud of expletives, before rejoining the hardstanding of Pennine Way and the field to the stream. I've seen videos of the top guys taking down this descent, route-one at full speed but I pick my way down it like someone trying to find a four-leaf clover. The climb back out over the stream is largely a walk which is disappointing. Partly the slippery nature of it but I've run a lot more of it before so I guess I'm not as fit. Work to do. Through the gate at the top and the sprint for home back to the Penistone Country Park, trying to overtake a few more on the easy-underfoot path to the finish. Great fun. And a brief moment of warm-glow health, queuing for an urn coffee and a broken digestive as the steam rises off you in the chilly air, before you drink far too much that night for New Year's Eve. Everyone heads back to the Sun pub and gets a head start on that, the raucous prizegiving showering the winners (Chris Farrell and Katie Walshaw) with random tins of biscuits and multipacks of Monster Munch as well as their crowns and bar handpump trophies.